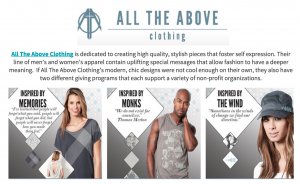 Congratulations to our Client All The Above Clothing for their feature onÂ Obviously MARvelous! All The Above Clothing is dedicated to creating high quality, stylish pieces that foster self expression. Their line of menâ€™s and womenâ€™s apparel contain uplifting special messages that allow fashion to have a deeper meaning.Â If All The Above Clothingâ€™s modern, chic designs were not cool enough on their own, they also have two different giving programs that each support a variety of non-profit organizations. The Give 10% program allows all ATA customers to give 10% of their total purchase to one of the many charities they partner with. A few examples include Special Olympics, Big Brothers Big Sisters, Breaking Silence and Save Our Youth, among many others. The Give 100% program allows ATA customers to purchase a special item that has been specifically and professionally designed for a unique charity. Each time that specific piece is purchased, the charity will receive 100% of the total profits. It’s clothing with a deeper meaning. Check them out at ata-clothing.com!